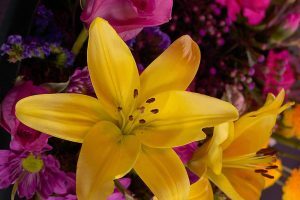 Whether you would like a simple but effective floral spray or a very personal flower arrangement to adorn the coffin, we work with local florists to create the floral tribute you choose. With seasonal variation, the possibilities are endless. We can suggest a range of options to meet your needs and budget, incorporating favourite flowers and colours. Floral Sprays are available from £30. An arrangement covering the length of the coffin can cost over £150, depending on the type of flowers chosen. The flowers will be delivered to us by our local florist on the day of the funeral to ensure the blooms are totally fresh. We serve families throughout the North East of England, please contact us to discuss how we may be of assistance.